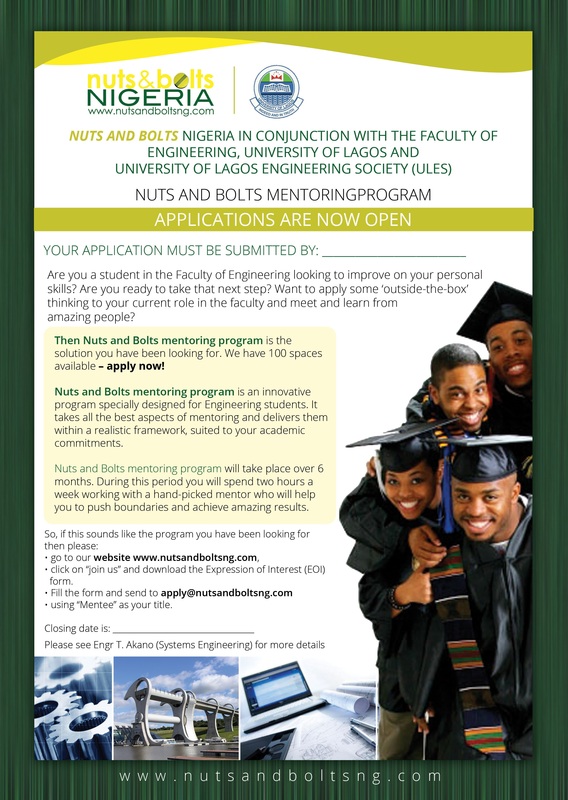 Nuts and Bolts (N&B) mentoring group is committed to improving the quality of Engineering and Science graduates coming through the academic system in Nigeria. 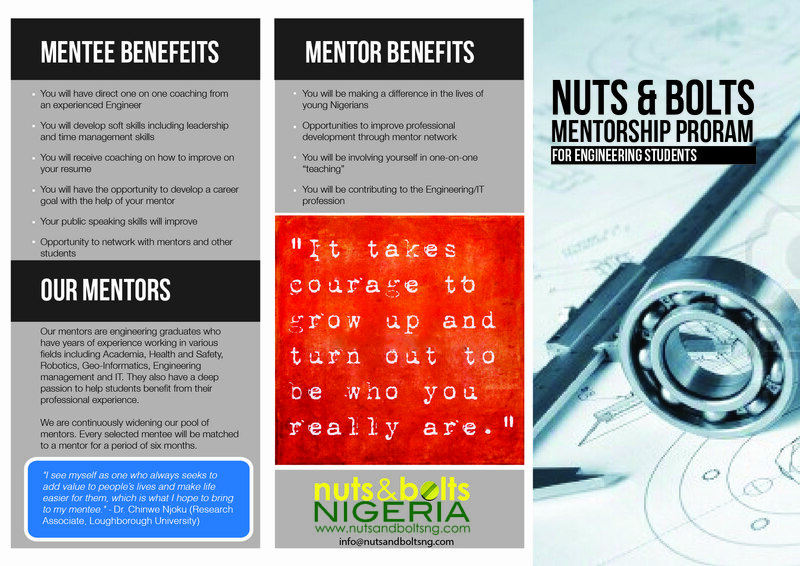 We have a wide range of mentors who are attached one on one with undergraduate students in Nigerian universities. These undergraduate students use their period of mentoring to learn from the experiences of their mentors. Majority of our mentors passed through the Nigerian academic system and hence understand the challenges faced by the students and are in a good position to give valuable advice. In addition, majority of our mentors have gathered experience in the industry both within and outside Nigeria. It is thus a great opportunity for the mentees to tap from diverse experiences. In addition to our mentoring cycle, we also organise workshops. Our workshops cover technical topics like hands on MATLAB tutorials and non-technical topics like how to work in teams. Our workshops are free of charge and we have had over 100 students in attendance at various workshops held at the University of Lagos, Nigeria. In February 2017, we will start a 5 weeks project management course for Engineering students at the University of Lagos. This PM module will be taught by US trained professional who is also an alumnus of the University of Lagos, Akoka. For this pilot project, we aim to train 15 students on skills required to excel as a project manager. This workshop will be held 100% online and it is important that participants MUST have access to the internet at the designated time (between 2pm and 3pm Nigeria time). Selection of candidates will follow a 2 step process. Prospective students will complete an application form. It is important that the students are spread across the entire departments in the faculty. Commitment to completing the five weeks module should be used as part of the selection criteria. The first 50 applications will be considered. Of this number, N&B will conduct an online test which will screen the number to the final 30. The 30 students will be interviewed and 15 students will be selected. The selected students will then be briefed/interviewed via an online induction event (details will be communicated later). N&B is committed to providing excellent project management introductory lessons to participants. This training will hold on Saturdays and will last for about 90 minutes per week. The participants will be given some exercises as homework and there will be a series of in class ‘tests’. The resource person is a US trained project manager with many years’ experience in the field. As a trained Engineer, he fully understands the needs of Engineering students when handling projects. Please note that only a certificate of participation will be given at the end of the workshop. This certificate will only be given to those who complete the 5 weeks training and who score above the pass mark as recommended by our resource person. Every selected participant must commit to attending every lecture at the workshop. The participants MUST also be punctual at lectures. All assignments and Exams MUST be done without any help from external sources as prescribed by the resource person. The University of Sydney takes great pleasure in announcing the Sydney Achievers International Scholarships for new international students commencing at the University in 2015. These prestigious Scholarships will be offered to high achieving, academically meritorious, international students, inviting them to enjoy the Sydney experience at one of the finest institutions of higher education in the world. Selection is based strictly on academic merit. For all enquiries regarding Sydney Achievers scholarships please email international.admissions@sydney.edu.au. To enquire about this scholarship: email international.admissions@sydney.edu.au. AUD$10,000 each per annum (ie, $15,000 in total for a 1.5 year program, $20,000 in total for a 2 year program), available for the CRICOS registered duration of a recipient’s program of study, for any Postgraduate Coursework program offered at the University of Sydney (subject to the recipient maintaining satisfactory academic progress each year). Applicants must have completed the equivalent of an Australian Bachelor degree qualification with outstanding results based on the Australian grading system, as deemed by the University of Sydney. Students who have already commenced/completed postgraduate studies are not eligible. No separate application is required for the scholarship. Applications for Admission to Semester Two 2015 are now open. To apply, visit our FIND A COURSE website. To be considered for the Sydney Achievers International Scholarship, a candidate must receive an Unconditional Offer of Admission. All eligible applicants with an unconditional offer by a specified cut-off date will be considered. From that pool, top-ranked eligible applicants will be selected and invited to complete anExpression of Interest form. All those returning a completed EOI form by the due date will be further considered, from which successful candidates will be selected and then offered the scholarship by email. To be considered, you must have an Unconditional Offer by 08 May 2015. Invitations to EOI will be sent to selected applicants by 15 May 2015. Applicants who returned their EOIs by 22 May 2015 will be considered. Offers for the scholarship will be made by 29 May 2015. Selection will be based strictly on academic merit as per the University’s admission requirements. Only applicants with unconditional offers of admission will be considered. Selection will be made by the Student Recruitment & Admissions Group, whose decision will be final. No appeals will be entertained. Scholarship recipients will need to maintain satisfactory academic progress, which, for the purposes of retaining the Scholarship, is defined as maintaining a credit average (at least 65%) or more each year. Failure to do so may result in the Scholarship being terminated. – may not be entitled to a ‘Leave of Absence’ during the duration of the Scholarship, unless it is due to extenuating circumstances. The University of Sydney reserves the right to make changes to this Scholarships program without notice and at its discretion. The man who does not read has no advantage over the man who cannot read – Mark Twain. I admit I have not always read this much non-fiction as I have always liked to read fiction, there was always something I looked forward to doing – reading novels – with the odd non-fiction book begging to be read. Not to say I didn’t enjoy reading the odd non-fiction like Ben Carson’s gifted hands but it wasn’t my ‘thing’. I also vaguely remember a few people urging me to read more non-fiction (maybe while trying to ‘sell’ me a book) but I easily told them – it wasn’t my ‘thing’. The reason is not far-fetched: Fiction fed my imagination and had the ability to ‘take me places’. A quick disclaimer though, I stopped reading M & B after a couple of years of starting – I found them repetitive even though they were ‘easy’ reads and had their peculiar allure. Having said that, my particularly favorite story I like to share is that of me shedding tears profusely while reading (Danielle Steel and more recently Half of a yellow sun) – it was almost as if I was personally affected in the present by their stories. Non-fiction on the other hand is arguably boring and more difficult to read BUT the benefits can be said to outweigh that of reading fiction – especially depending on what you start out to achieve. I personally disliked ‘self-help’ books: my argument being that there was no one way to achieving or being something and anyone trying to shove their ‘success’ story down my throat will have to do more than sell me a book… My perspective has changed ever so slightly and I think even ‘self help’ books have their benefits. My aim in the last couple of years is to have at least one fiction and one non-fiction book at any given time – it would seem that I’ve had more of the latter in that time – wonders shall never end! Talking about wonders, in this day and age where there are audio books, even people that don’t like to read or are unable to read, can benefit from ‘reading’. I am hoping, we all agree that there are benefits to reading (reading in this context relates to ‘leisure’ reading and not in the academic sense). So when I decided to post about reading, I had in mind sharing some gist on reading and also other self-development options that should come in handy. The best part is that they are free useful and online. My all time favorite is Coursera and I just finished a short course on learning how to learn which I found instructive! There is also code academy where you can learn various computer programming languages. There is mindtools app and of course TedEx, subscribing to free podcasts and a host of other free resources. A comprehensive list can be found on www.mooc-list.com. I used Audibles to buy a few audio books and I enjoyed being able to multitask, I also got a few free online downloads though they were mostly not the full books. 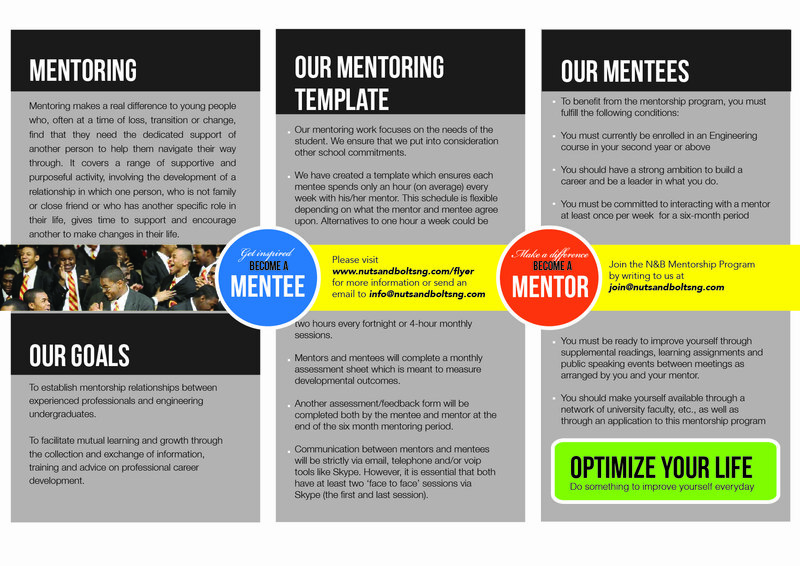 I am sure many of the mentors can add to the list – please feel free to do just that! To round this up nicely, it is important to read – more in the unacademic sense than in the academic sense. Investing (time AND money) in this practice (it’s a hobby for some people) is invaluable: more valuable than spending time in front of the TV or aimlessly on social media. I don’t intend to suggest that anyone reading this should jump from reading one book (GEG) to another (fiction/non-fiction), or that reading fiction is a pure waste of your time, I am only suggesting what I know to be true – what you will realize to be true in the near future. It is my intention to stress the importance of balance – among the things we spend our leisure doing of which reading for leisure and reading instructive material for leisure should be one. Fill and submit to Kehinde Orolu – lecturer, department of Systems Engineering, University of Lagos. Make sure you attach your most recent resume. Development of your mentee depends on exploring career aspirations, strengths and weaknesses, collaborating on means to “get there,” implementing strategies, and evaluating along the way. You as the mentor provide the “light” for the mentee to follow. Sharing your wisdom and past experiences is what the mentee looks for from you. Free as in free! Who doesn’t like free stuff? I’m yet to find someone who doesn’t. I know the general feeling is that if it’s free, it has probably been watered down, I can however speak for the courses I have taken from the websites I am about to introduce to you, they have in no way been watered down! In fact some of them are delivered exactly the same way as they are delivered to their students at the various universities. If it’s so, why then deliver free online? Well, one word – passion! These guys are just passionate about education that they are willing to share with others for free. Hard for some of us to comprehend right? We envision a future where everyone has access to a world-class education that has so far been available to a select few. We aim to empower people with education that will improve their lives, the lives of their families, and the communities they live in…. We offer courses in a wide range of topics, spanning the Humanities, Medicine, Biology, Social Sciences, Mathematics, Business, Computer Science, and many others. Whether you’re looking to improve your resume, advance your career, or just learn more and expand your knowledge, we hope there will be multiple courses that you find interesting. I must admit, the modules can be really engaging. You will have assignments to submit and even a final exam for some of the modules. What were you saying about being watered down? 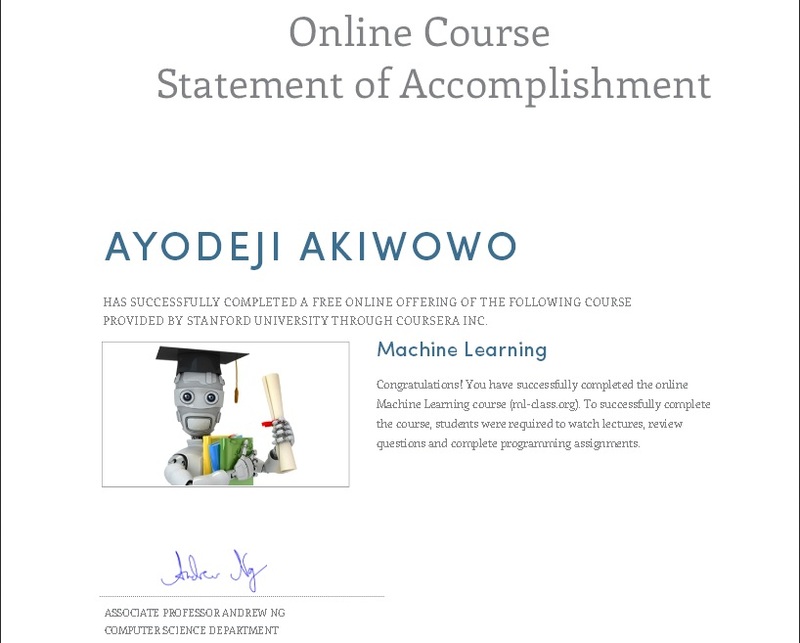 Since my Machine Learning course, I have gone on to take the “Computing for Data Analysis”, “Learn to Program: The Fundamentals” and other courses. So what are you still waiting for? Enroll in a course today! UP NEXT in Part 2 … UDACITY!